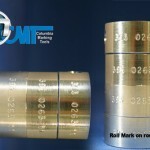 Project scope: CMT to supply two model 260 Roll Marking Machines. Customer to supply part fixturing. Marking legend is typically 6-8 (1/8″) characters and the Customers Logo, estimated marking time is 3 seconds. Parts are threading inserts that will be marked on the flat top side of the parts. Note: machine to have CUSTOM BASE with height of 38″ from floor to part fixture mounting surface. Also to have CUSTOM PALM BUTTON arrangement with horizontal mounting of buttons to column (not base), these buttons are to have special LOW PRESSURE push settings. 3 different part fixture drawings were provided to CMT: – EJ727 sheet #5 is a riser plate of some kind with a height of 3.125 inches – EJ727 sheet #4 is an adapter plate of some kind with a height of .750 inches – J23867 sheets #1-#6 are insert holder fixtures that range in height from 1.0 inches to 2.2 inches with a mean height of 1.6 inches. Based on the provided drawings CMT will use the combined height of all three part fixture details of 5.4″ from our table mount surface to achieve the 38″ height from floor as stipulated in the above note. CMT will send approval drawing for customer signoff showing this height, signing the drawings means that you have approved this fixture stackup calculation as being correct or representative of the typical fixture height that you will use. 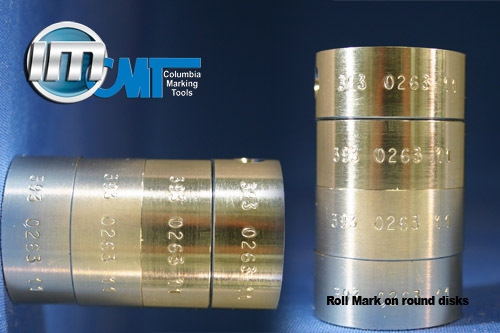 Project Scope: CMT to provide air powered roll floor style roll marking machine with part handling for customer integration. Marking legend will consist of 35-40 characters, the mark will incorporate stamp dies and numbering head.